The case study region is the Biebrza Valley, particularly two Natura 2000 sites there, that is “Dolina Biebrzy” (SCI, PLH200008) and “Ostoja Biebrzańska” (SPA, PLB200006). The valley and its wetlands are partly located in the Biebrza National Park in northeastern Poland, in the Podlaskie Voivodship. The two Natura 2000 sites cover 148 508.8 hectares. This natural and semi-natural wetland complex gained popularity for its unique wilderness: a number of rare, often endangered, bird species and their habitats, and other flora and fauna species. The Biebrza Valley is one of the largest wildlife refuges in Europe. Local stakeholders identified biodiversity and traditional local scenery as the most important public goods of the region. They chose them because they coexist inseparably and face similar risks. The region was included in protected Natura 2000 area, because it hosts a number of habitats listed in the EU Habitats Directive and Birds Directives with highest priority of conservation. The two identified public goods – biodiversity and scenery – are largely located on private land (Natura 2000). Abandonment of traditional agricultural practices and subsequent intensification of agricultural land use have led to the decline of both of them. Maintenance of this rich biodiversity range requires active management of non-forested wetland ecosystems. These wetland complexes were created semi-naturally, as a by-product of extensive agricultural land management, and are now considered an integral part of the traditional local rural scenery. Conservation of the whole mosaic of unique wetland habitat types, especially valuable wet meadows, requires that farmers use traditional, mostly abandoned traditional agricultural practices. Such extensive farming practices include mowing and grazing on wet meadows. 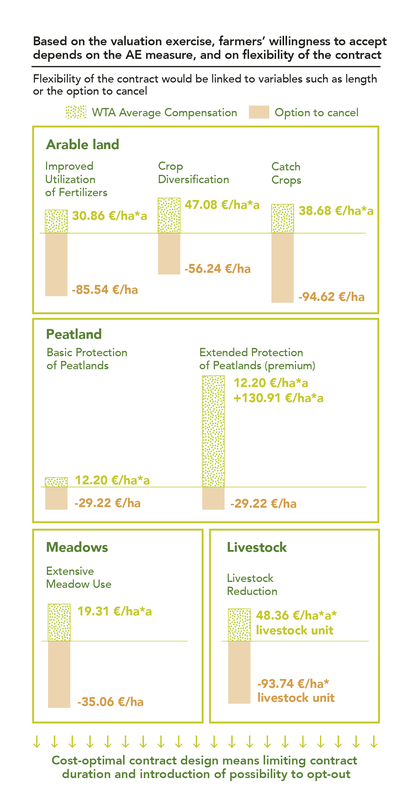 Forest cover of the area has grown by nearly 95% over the period of 30 years, non-forested meadows continued to diminish, as farmers chose to abandon the most demanding wet meadows. At present, grazing and cutting regimes of the area are significantly different than 30 year ago, accompanied by simplified, less work-intensive practices. 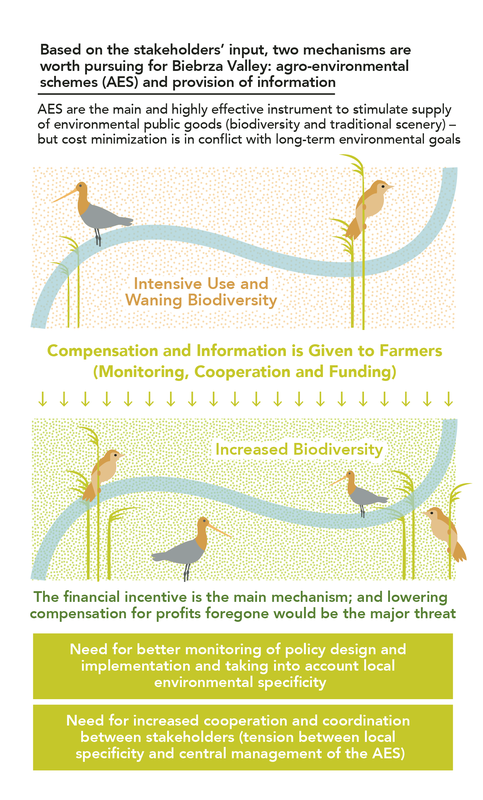 This requires an action: farmers, without political and financial support, will not choose extensive practices that have the potential to create unique ecosystems because they are demanding and costly. The practices include those performed on all kinds of privately owned land: improved utilization of fertilizers, crop diversification, catch crops on arable land; peatland protection; extensive mowing and grazing, and reduction of livestock on meadows. We decided to analyze the provision of public goods (mainly biodiversity, with unique species of birds) by the river valley agricultural system in the context of intensification of agricultural land use (and abandonment of traditional agricultural practices because of their increasing alternative costs).